The 2016 Syrah is effusive in the glass. 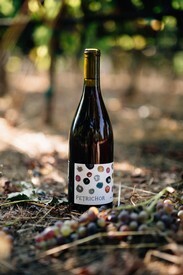 The wine exhibits white pepper and violet aromatics on top of dark fruits. The palate shows the savory side of the variety with salty cured meats, pepper and chalky tannins. This wine will pull on your heartstrings. The 2016 Grenache has beautiful red-berried fruits with floral lifts. The chalky fine tannins are suggestive of place and the volcanic soils of Petrichor Vineyard. Suggested decanting upon opening. 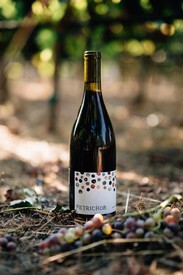 Our 2nd vintage producing single varietal Syrah! The 2015 Syrah is full of beautiful savory tones. It is smokey, leathery and meaty and displays notes of spice while underlying red fruits linger on the palate. The 2015 Grenache is fresh and floral with great focus and structure. It displays notes of juicy red fruits and herbs that are backed by a lifting acidity and silky textured tannins. The 2015 Les Trois shows the signature Syrah dark fruit flavors underlined with savory notes of black olive and pepper. 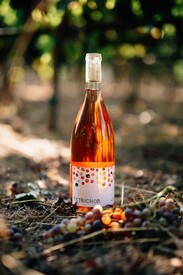 The Grenache lends a juicy mid palate to this blend. Structured for aging and longevity but a pleasure to drink now. You'll find it a perfect companion to any dinner party - not too big, nor too shy - to stand alongside diverse flavors. The 2014 Les Trois is savory on the nose with notes of pepper and underlying dark fruits. The palate shows smoked meats, herbs and black cherries. This wine is structured with leathery tannins and will age gracefully. Suggested Pairings: Lamb, Stew, Lamb Stew! The 2017 Rosé is a beautiful pale pink, displaying notes of white pepper alongside bright aromas of red berries and watermelon. The palate shows green watermelon, herbs de provence and refreshing acidity. Pair with cured meats, zesty salads and dishes with spicy heat. 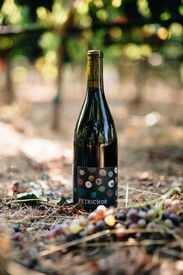 THE TWO AND ONE-HALF ACRE Petrichor Vineyard is perched high above Russian River Valley atop the westernmost ridge of the Mayacamas Mountains that divide Napa and Sonoma counties. This unique quadrant of Sonoma County boasts a unique well-drained volcanic soil with exposure to the North,West and South and a semi-maritime influence distinctively its own. YOU LIKELY KNOW THAT SCENT. On first learning its meaning, we were transported to those dry, dusty days in summer that are often interrupted by afternoon showers.